Approaching the Eiffel Tower following any of these 3 routes starting from the Beaugrenelle Quartier means savoring the Tower from different perspectives. 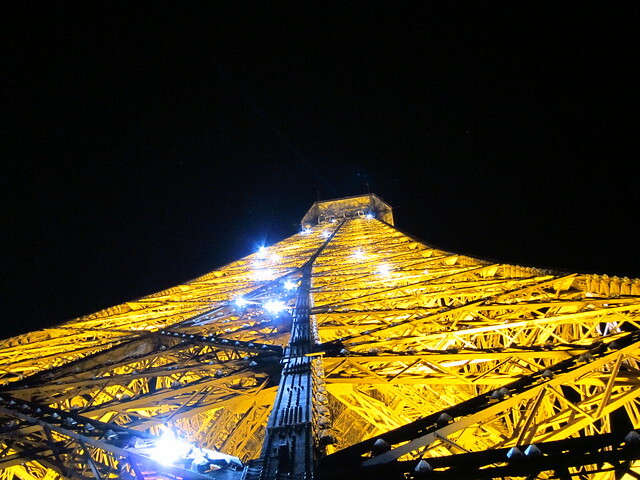 Let’s get closer to the Eiffel Tower! If you walk along Quai de Grenelle, when you pass Pont de Bir-Hakeim, you will enter a green esplanade called Promenade d’Australie. Raise your eyes and you see the Eiffel Tower. You can also walk down to Port de Suffren by the Seine beside Promenade d’Australie. With the Seine on your left and the Eiffel Tower on your right, you’re surrounded by Parisian beauty. If you walk along Voie Georges Pompidou, you will be confronted with a scenic view of the Seine with a clear view of the Eiffel Tower in the background. The closer you get to the Tower, the more grand you feel about it, and the smaller you feel about yourself, in a good way though. Zoom in your camera and capture the grill work of the arches of the Tower. Once you reach Quai Branly, the famous Jardins du Trocadéro on your left side will draw your attention, and Palais de Chaillot is right behind Jardins du Trocadéro. Walk up to Palais de Chaillot and appreciate the Eiffel Tower from a few different angles from there. 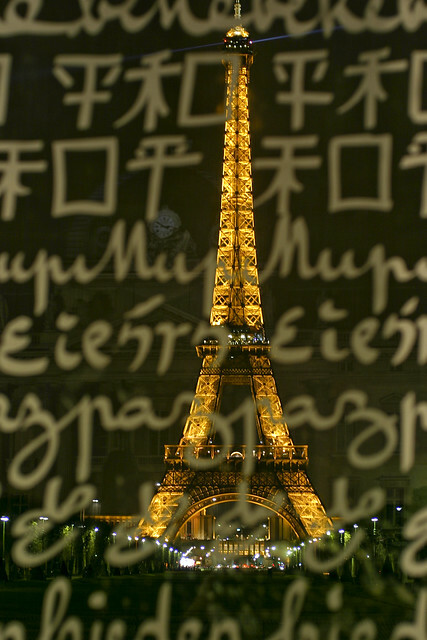 You will also be able to view Eiffel Tower clearly at night from the Palais de Chaillot. If you walk down from the side stairs of the Palais de Chaillot, you will see tourists enjoying posing in front of the Fountain of Warsaw, which is part of the Jardins du Trocadéro. In summer, the scene is decorated with flowers in the foreground. Walk further down and get close to the Fountain of Warsaw in the Jardins du Trocadéro. When the fountain is calm, you can enjoy an uninterrupted and serene view of the Eiffel Tower from the Jardins du Trocadéro. If you walk along streets in the Beaugrenelle Quartier towards the Eiffel Tower, you will be able to approach the Tower from Parc du Champ de Mars, yet another perspective. My trip was planned, yet unplanned. It was planned in the sense that I planned where to stay, my budget, my monthly Métro pass, a few walking routes and itineraries. Unplanned, because even though I planned all my visits to major attractions, my plans unraveled when Paris kept surprising me with its beauty at every corner. Whether you stroll towards the École Militaire via the Champ de Mars, or you enter Champ de Mars via Place Joffre, the Wall for Peace monument with the Eiffel Tower in the background will amaze you in any light and from any angle. 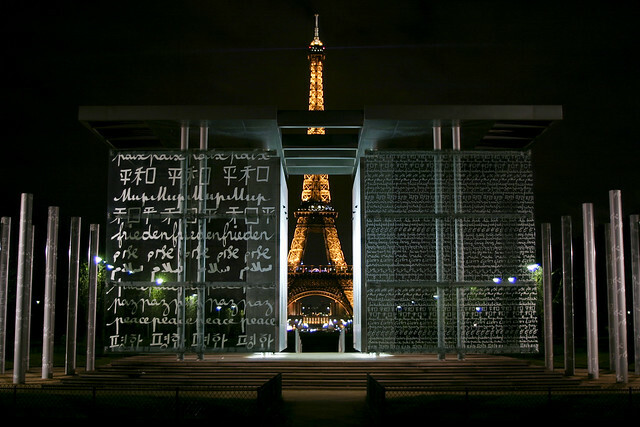 You will see the word “peace” written in 49 different languages on the glass façades and the pillars of the monument. You can also approach the Parc du Champ de Mars from Quai Branly, just continue your walk across to the Tower and then turn your head. If you are there on special occasions, you might be lucky to see something unusual, for example, this red scale model of the Tower. Of course, Bastille Day celebrations at Champ de Mars should not be missed. So true! I had the exact same thought while discovering Paris and inevitable Tower in million different points of view. Paris has that magical power to make you appreciate everything so much, even when you’re not in that kind of mood at the moment 🙂 You just can not be grumpy in Paris. This city is pure love. ahahaha ^^. Yes you can be grumpy in here :-). Especially if you work there. Sometimes the pressure is too strong. Paris is like New york, you have to stand the distance. But oh boy, how she knows how to reward you. This town is always surprising me by its versatility. I imagine that the felling of standing next to the Eiffel Tower must be similar to the one experienced by an ant when is next to a human. The Eiffel Tower is so big and outstanding that every single being standing on the bottom of it must probably be reduced to single molecule. This brings so many fond memories. Standing so close beside or underneath the steel grandiosity is quite an experience. I remember I was in pure awe just by being in the spacious presence of the Eiffel Tower itself. Whether experiencing it during the day under the grayish sky or during the night under the starry sky the feeling remains the same. The Wall for Peace caught my eye, though because it is the perfect timing for peace to rise as tall and confident as the Eiffel Tower.